Only getting short-term relief following a deep tissue massage? Are you fed up with that tight, niggling, annoying pain in your body? Remedial Massage at Melbourne Muscular Therapies is unlike any form of massage you might have experienced. 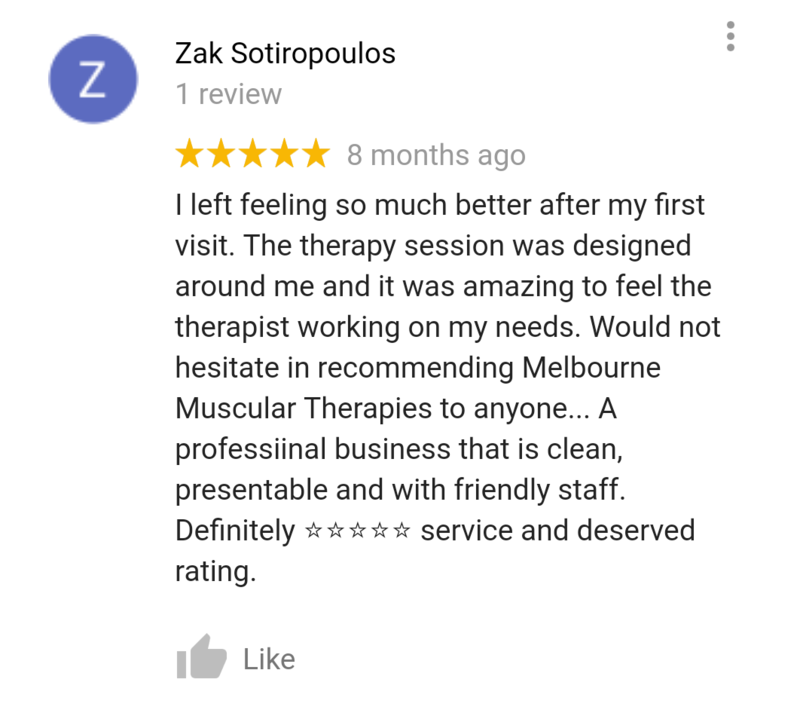 Solidified Connective Tissue Release (SCT Release) is an internally developed method and strategy of remedial massage that is exclusive to practitioners at Melbourne Muscular Therapies. SCT Release accesses areas of pain within the human body that no other form of remedial massage can. Treatment is delivered in a way that is slow, deliberate, intuitive, and patient in order to manipulate, stretch, and release solidified tension and pain within the body. Developed over 20 years ago by founding practitioner Marcus Sinfield, SCT Release has been proven to create flow, heal, release, and eliminate even the most chronic forms of pain and dysfunction within the body. SCT Release is a deep form of Myofascial Release (Deep Tissue Massage), which targets musculotendenous junctions, tight muscles, bound up fascia, compressed nerves, and general solidified connective tissue. The depth and slow pace of our treatment allows us to target these areas in order to ultimately eliminate all pain. Over time, lack of movement, previous injury, poor biomechanics, bad posture, and emotional events can lead to tight and compressed muscles, neuromuscular guarding, dehydrated and angry fascia, which will cause pain. If left untreated, these issues can end up being chronically deep seeded within the body. SCT Release is proven to be effective with both acute and chronic dysfunctions. Our practitioners are all highly skilled at identifying the underlying cause of your pain, and developing a treatment protocol tailored to your needs. Treatment will be administered with such precision and patience, which will allow your body time to register the sensation and react, release, and calm accordingly. 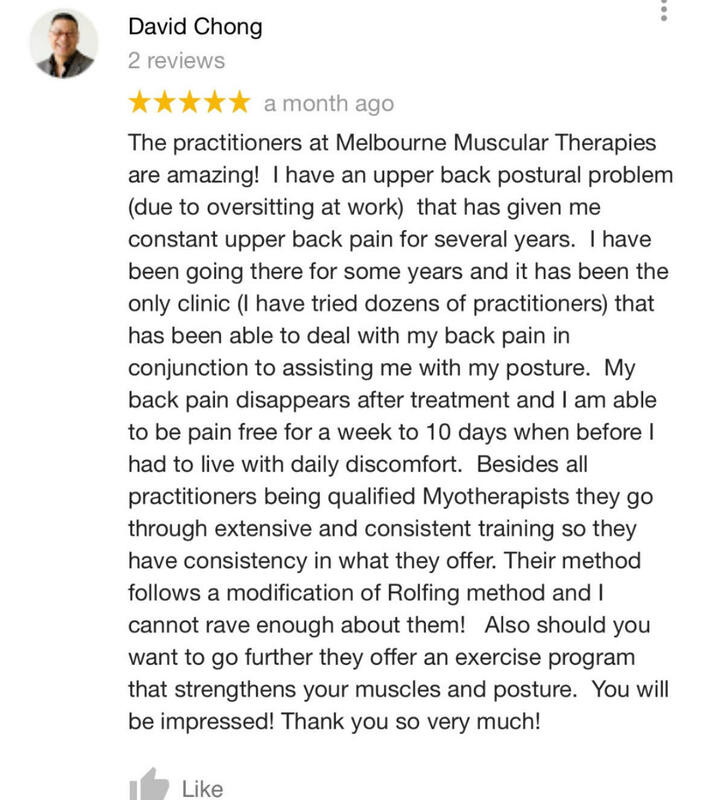 Practitioners at Melbourne Muscular Therapies pride themselves on treating the cause of your pain, not just the symptom. 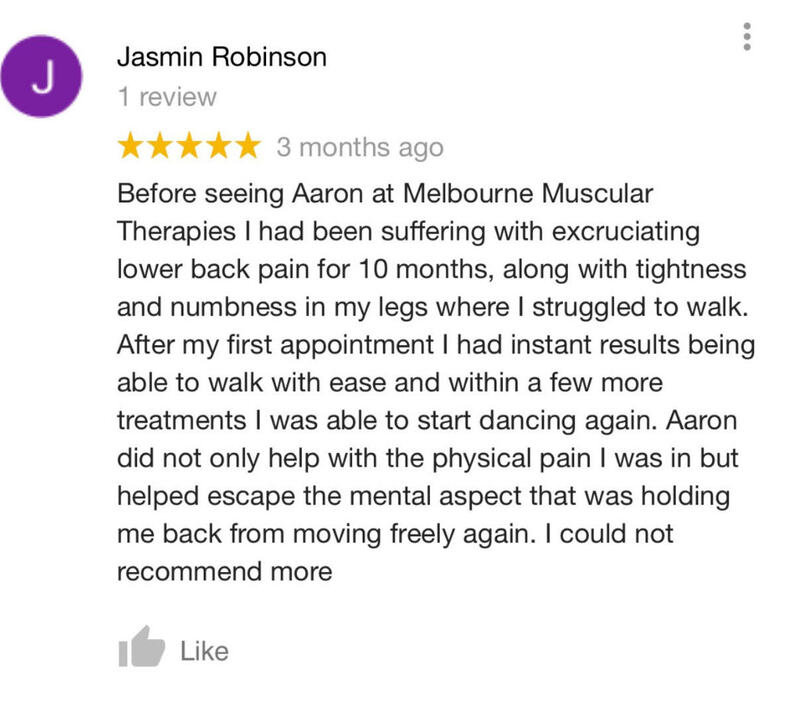 Whether you’re waking up with a sore neck, a sports related hamstring injury, chronic 10 year lower back pain, or poor posture, our practitioner will be able to eliminate your pain and get your back living your life to the fullest extent! Our massage is tailored to your individual pain tolerances. We also work with our customers to ensure there is adequate levels of comfort, relaxation, and effectiveness. We believe optimal healing occurs on the border of challenge and support. Treatment can be challenging, however we always offer support during this process. Effectiveness is the best measure of truth! What's the difference between deep tissue massage & remedial massage? The only difference between the two is that ‘Deep Tissue Massage’ refers to treatment which effects the deepest layers of muscle and fascia. Is remedial massage the same as physiotherapy ? No. Remedial Massage is treatment based on ‘hands on’ massage and bodywork in order to heal, relieve pain, and improve functionality. Some Physiotherapists use remedial massage as a modality to heal, however their treatment is more focused on exercise prescription. Ideally once a week! Once a month at a minimum. This is a very open ended question. It is dependant on the person, the presenting complaint, and how willing you are to change your habits, commit to a program, and alter thought processes. Some cases take 1 session, some take 6 months, some are ongoing!